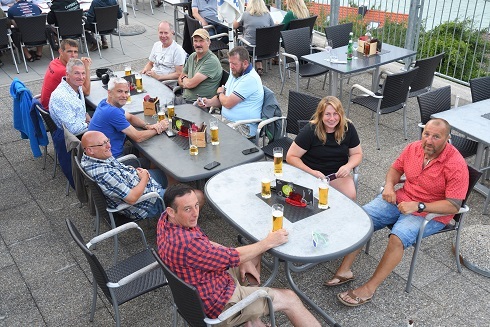 A group of some old members of the club, and veterans of many BCC Alps trips over the years were joined by a group from Broomhall CC for another Alps trip to our favorite destination, the Austrian Tyrol. Those attending were: Paddy, Dave T, Guy, Al P, John J, and Ant from Battersea CC. Tony, Shaun, Marcus, Matt, Rob, Lisa and Ant from Broomhall CC. Four cars set off from various parts of England: Bristol, Sheffield, London, Manchester. Paddy and Dave set off early on the Friday to avoid the overnight drive. They stopped at a campsite on the Austrian border near Reutte for a good night's sleep ,whilst the other cars drove throughout the night after a week at work! On Saturday morning two cars and five paddlers, (Paddy, Dave, Tony, Marcus and John J), met at the put in for the Loisach in the Garmisch area. The other cars were either still en route from Calais or were too tired from the drive to paddle. The Loisach is a small volume and technical river unlike most of the other sections which we paddle in the area. Thanks to some heavy rain, the river was at medium levels, (i.e. starting to turn brown). As some of us had not paddled on white water for sometime, it was an 'interesting' warm-up paddle. The run was event free but needed constant concentration due to all the twists and turns. We met the rest of the group cars at the campsite at Prutz. This was midway through the World Cup, so a big TV screen was located at a bar in Reid. We all met up to watch the England vs Sweden match along with some Swedish tourists. 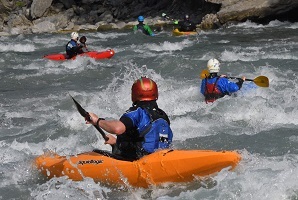 The next day we all did a more relaxing warm up paddle on the Imst section of the River Inn. This is big and bouncy and a good introduction to paddling in the area. The water level was lowish but picked up after the confluence with the River Oetz. This was followed by beer and food at the cafe at the take out. Most people opted for Tiroler Grostl, the Austrian equivalent of a Full English Breakfast! Most of the group then did a paddle on the Sanna, which was also lowish, but still a good paddle. The rapid through the centre of Pians is long with several stoppers which are best avoided. Monday started with another run down the Sanna followed by a run on the Tosens section of the Inn. On the following day we drove to Switzerland to paddle on the Schuls gorge section of the River Inn. 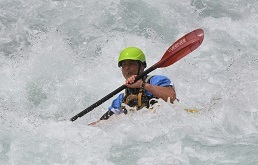 This is mainly G2-3 with 3 Grade 4 rapids. There is a riverside cafe in Tarasp, so we stopped for a coffee halfway down the run! The last Grade 4 rapid, ('Against the Wall'), has changed dramatically due to flooding and now diverts the river into a much easier channel far away from the wall. After the paddle some of the group drove up the mountain to Samnaun to buy some duty free goods, (i.e. cheap hooch). 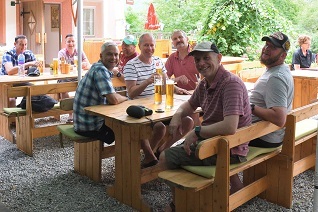 You can't go to the Austrian Tyrol without doing some hiking,so a small group, (Al, Ant, Dave, Guy, Paddy), set off from the campsite up the mountain to Fiss. The scenery is amazing. The others did three runs in a day: Sanna , Landeck Gorge and Tosens sections of the Inn. The evening was spent in a small bar in Prutz, watching England crash out of the World cup. 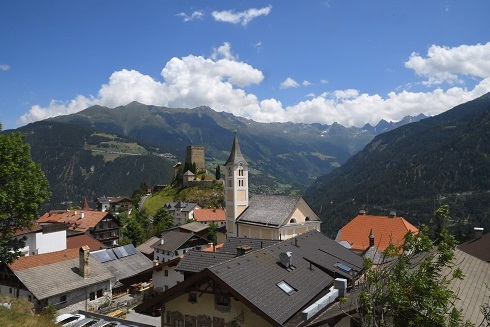 I hired an E-bike, (it's the Alps with steep mountains! ), on the Thursday and went further and higher than would have been possible on a normal bike! The route to Pfunder Tschey had amazing scenery all the way! The others did a paddle on Tosens. Friday was our last day's paddling. It started with another run on the Sanna, (most people's favorite run). This was followed by a run on the Landeck Gorge. The level was lowish but it is still big and bouncy all the way down to Landeck. Our last evening together as a group was spent having a meal at the Pizzeria overlooking the stunning views of Prutz and the surrounding mountains. It was a great trip, enjoyed by all. The levels were mainly lowish compared to previous trips, which suited some of us. The paddling was incident and stress free! No swims except in the lake. There was no need to chase swimmers or boats! There were just few rolls. Looking forward to the next Alps trip!